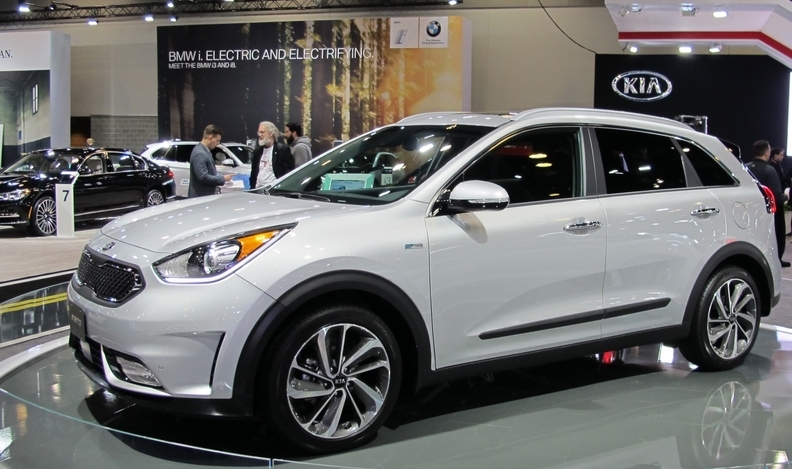 The then-new Kia Niro was part of the 2016 Vancouver International Auto Show. VANCOUVER – The Vancouver International Auto Show falls fairly late on the car-show calendar, which usually means most everything on the floor of the city’s waterfront convention centre has debuted somewhere already. But show spokeswoman Hayley Thomas said there will be at least one North American and one Canadian new-model unveiling when the six-day show opens Tuesday. Even if they debuted elsewhere, this will be the first chance many of the 100,000 or so visitors will have to get an up-close look at cars like the Canadian-made Ford GT. The 600-horsepower supercar began rolling out of Multimatic Inc.’s Markham, Ont., facility in December at an initial rate of two a week. The prototype was first shown at the Detroit International Auto Show in 2015. They’ll also get their first look at the 12-cylinder Bentley Bentayga SUV, which has a base price of about $250,000. Concepts scheduled to appear include the Acura Precision and Lexus LC 500 coupe. The Automobile Journalists Association of Canada will present its Green Car and Green Utility of the Year Awards. Green car contenders this year are the Chevrolet Malibu Hybrid, Kia Optima HEV and Toyota Prius (Technology Package), while the Mazda CX-9, Subaru Forester and Toyota Rav4 Hybrid (Technology Package) are finalists for best green utility. The show is slated to feature 39 individual marques, as well as dealer displays. Visitors not building short lists for their next new-vehicle purchase can check out some wild custom cars at the Monster Energy Dub Show. There’s also vintage iron such as a bulletproof ’37 Cord commissioned by notorious Louisiana politician Huey (Kingfish) Long, who was assassinated before it was delivered. Debuts aside, this is an important show for dealers. British Columbia was Canada’s fourth-largest vehicle market last year, with more than 216,000 sales, up 5.3 per cent, just behind Alberta, which has been declining thanks to the energy-industry downturn. The show last year drew a record crowd of 101,853, about 5,000 more than 2015 despite being shorter by one day.